The story starts after Big Bear and Little Bear have had a fun day playing outside and it is time to go back to the cave and for Little Bear to go to sleep. (Big Bear is hoping that he might get to read his book!) Little Bear is put to bed in the dark part of the cave but he can’t sleep because he is afraid of the dark. ‘Can’t you sleep, Little Bear?’ asks Big Bear, and he is told by Little Bear that it is scary in the dark. Kind old Big Bear goes to find a little lantern which he thinks will do the trick, puts it on and goes back to his book. This lantern does not give enough light though so Big Bear has to find a bigger one, and so it goes on. Each time he asks ‘Can’t you sleep, Little Bear?’ and after many reads my daughter loves joining in with these words! Big Bear is beginning to despair, as every time Little Bear says that there is still dark left, but eventually comes up with an idea. He takes Little Bear outside and says to look up at the sky and shows him the biggest lantern of all. ‘I’ve brought you the moon!’ he says and at last Little Bear is reassured and goes back to bed feeling warm and safe! And yes, finally, Big Bear does get to finish his book! This book is great for exploring lots of ideas especially children’s fears of the dark. It has wonderful illustrations with so much to talk about and look at on every page. I can also emphasise with Big Bear, having young daughters whose fears I have to dispel regularly, and often I think I have found the solution only to discover they need more reassurance! And like Big Bear, I often attempt to read my own book with little success too! 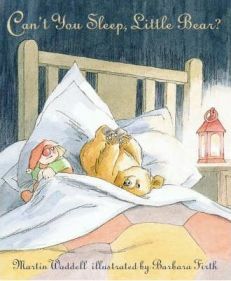 ‘Can’t You Sleep Little Bear?’ is published by Walker Books. It was the winner of the Smarties Book Prize and the Kate Greenaway medal so it has been well acclaimed. This is such a lovely book to share with your little ones and I thoroughly recommend it! If your children are anything like mine, they will want to read it again and again! No Comments on "Can’t You Sleep, Little Bear?"